They’ve been doing this for hundreds and hundreds of years if you study the history of Islam…You can’t solve it with a dialogue. You can’t solve it with a summit…You solve it with a bullet to the head. It’s the only thing these people understand. Of course the only thing people at FoxNews understands is the language of racism. It doesn’t matter that Muslims universally have condemned what this latest atrocity from ISIS depicts, in fact FoxNews will insist there are no voices of contempt from Muslims….something that’s been disproven time and time again. But in case FoxNews doesn’t get it, such blatant incitement is not acceptable for Americans on American airwaves…or at least not acceptable to some and especially Asian American Journalists who condemned in the strongest terms Tantaros’ diatribe and I salute them. Racism is unacceptable even if one is not the intended target, something the likes of Tantaros probably doesn’t get. 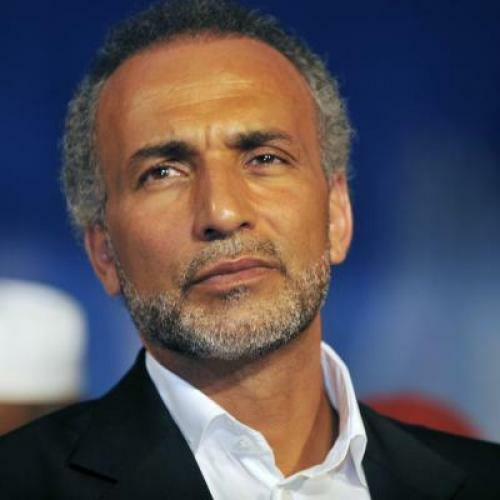 That’s what Tariq Ramadan says should be the attitude of Muslims in the West and anything less than that is unacceptable. The leaders of ISNA can boast a proud record of service to American Muslims, for which they must be thanked and congratulated. The annual ISNA convention is an important gathering, featuring a multiplicity of participants and a broad cross-section of activities. In recent years, however, the political positions taken by the organization’s leadership have not always been clear-cut. Though it is essential, I believe, to remain open to dialogue with the authorities, it is likewise essential that positions of principle must be maintained, re-affirmed and defended. Not simply for the good of the Muslims, but in the name of the contribution of American Muslims to their society. Criticism of the domestic policy of the current administration, like those that preceded it, is a moral obligation. Summary arrests, arbitrary prison terms, inhuman psychological torture and solitary confinement, the shadowy role of informers and the deeply troubling and unacceptable methods used by the FBI, which has provoked young people to engage in extremist actions, must be unconditionally condemned. Not in the name of Islam, but in the name of the values proclaimed by the United States. However, the ISNA leadership is too often silent, as if paralyzed by fear. It fares no better with respect to American foreign policy. Its silence over American support for the outlaw and inhuman policies of Israel cannot be justified, even less so after attending an iftar organized by the White House during which President Obama defended Israel while the Israeli ambassador tweeted his delight! We cannot be forever silent: what kind of active and responsible citizenship does the ISNA leadership offer young American Muslims? What kind of example? That of silent, fearful sycophants–or of free, public-spirited citizens who, while defending the values of human dignity and justice, serve their country in the most sincere and critical way? That of the unconditional loyalty of the timorous, or the critical loyalty of free individuals? To attend the ISNA convention would be to endorse their silence. In fact this is the way all encounters should be handled between police and citizens, patiently and deliberately, but unless you’re an armed white man it never does. If you’re black the least you could hope to happen is being assaulted; the most likely thing to happen is you’ll be shot and possibly killed. On May 4, Kalamazoo Department of Public Safety officers responded to multiple reports of a man, possibly intoxicated, carrying a rifle along East Cork Street in the city’s Milwood neighborhood. Joseph Houseman, 63, was eventually persuaded to hand over the gun, which was returned to him the next day. Police considered but ultimately decided against seeking a misdemeanor charge of brandishing a firearm. Police reports and recordings from dash-mounted cameras in patrol cars and body microphones on officers, obtained by the Kalamazoo Gazette through the Michigan Freedom of Information Act, reveal how officers deliberated over how to enforce the law and protect public safety while respecting the man’s right to bear arms. Police misconduct against ANY citizen of America usually gets swept under the rug…….and even when its recorded for all the world to see it gets ignored, given the proverbial blind eye. In the case of Marcus Jeter who thought all was well after he left from his first encounter with police…..left with their permission, he’s lucky to be alive while the police have been charged with official misconduct and related charges. The police abuse was captured by the police’s own dashboard cameras yet the same police in preparation for their court case want to dismiss their own evidence!! Jeter is lucky to be alive….and his case is one of those rare examples where police are being held accountable for their egregious behavior. Israel, that racist bastion of religious zionist zealotry and Islamophobia (two deadly combination for everyone) is hell bent on killing Muslims and destroying their religious symbols. This article makes that painfully obvious. The Israeli onslaught on Gaza demolished 73 mosques in 51 days, while 205 others were partially destroyed, a government report said. According to a committee formed by the Palestinian Economic Council for Development and Construction, the damages caused by Israeli aggression on houses of worship, tombs, and charity offices amount to $40.4 million. 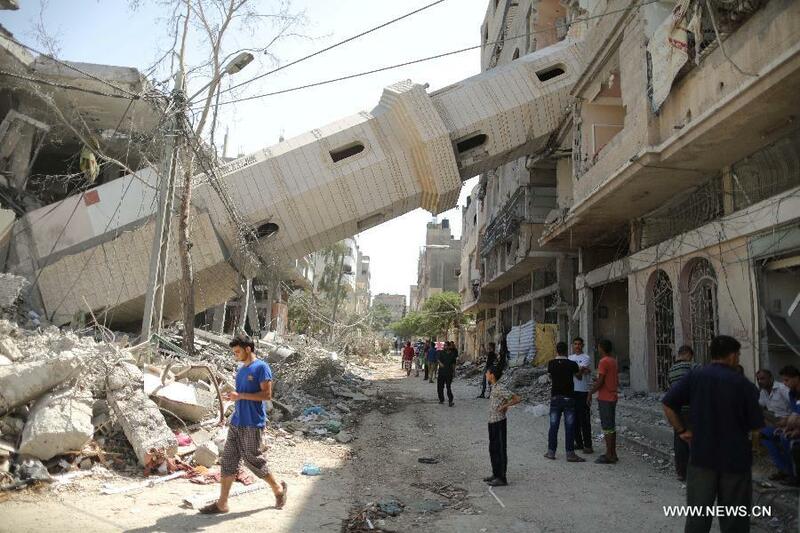 The only two churches in Gaza were also hit and partially damaged, while the gates of 10 tombs were destroyed. The affected mosques represent one-third of Gaza’s mosques, the committee said. Among the destroyed mosques were historical ones, particularly Al-Omari Mosque in Jabalya which dates back to 649 AD. The mosque was built 1,365 years ago during the rule of the Muslim leader Amr Ibn Al-‘As and was named after him. It is also called Manarat Al-Zaher. It consisted of three floors and its area was greater than 3,000 square metres. It could accommodate more than 2,000 worshippers. Al-Omari Mosque was previously hit by Israeli strikes in 2008 and 2009 and later renovated, but it was completely destroyed in the most recent assault. The report added that most of Gaza’s mosques were built thanks to donations by citizens since donor countries exclude houses of worship from reconstruction aid. The targeting of mosques by Israeli warplanes in the latest offensive was three times higher than in 2008 and 2009, the report said. It’s very difficult to imagine why and how any country that calls itself a democratic country could support an entity that so recklessly and blatantly targets a religion and its adherents as Israel does with Palestinians and Islam. There’s a lot to say about being a minority in today’s America and from where Miscellany101 sits none of it is good. We haven’t talked about the shooting of Mike Brown in Ferguson, Missouri although at some point we will, nor have we really dealt with Eric Gardner’s brutal publicly recorded execution by New York City police although we should. If one really wants to know the depths of American racism, however, and with out ambiguity attached….you only need to look here, where Raymond Wilford was pepper sprayed because he was walking down the street minding his own business and ran across a security guard who thought it was his time to dispense some street justice to the first black person he saw. Twenty-five-year-old Raymond Wilford, who is black, was walking by on his way to meet a friend at the Westlake Center mall. The shirtless man spit at him, Wilford said, and the two squared off but didn’t throw any punches at each other. Then a Westlake security guard appeared. “The security guard was like, ‘Stop,'” Wilford said in an interview. “The white guy was still yelling and walking towards the security guard. I was like, ‘Why are you pointing your Mace at me? He’s the one being aggressive.’ And then he [the mall cop] pepper-sprayed me.” According to witnesses and a police report, the spray blew into other people’s faces and left them with red eyes. Even shaking hands and greeting one another on the street can get black men in trouble with the law even when they ARE the law in today’s America. 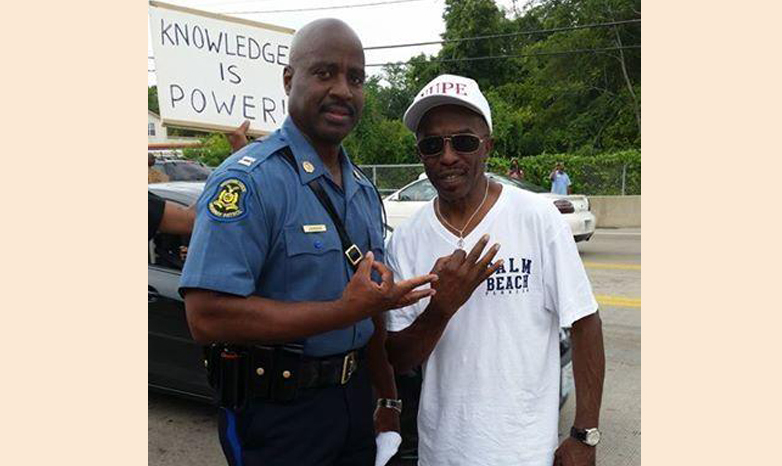 Today in Ferguson, Mo., news, The Washington Post takes on the assertion that Missouri Highway Patrol Captain Ron Johnson has been photographed flashing gang signs with members of the community. To reiterate: Capt. Johnson is a member of Kappa Alpha Psi, a black fraternity that was formed in 1911 at Indiana University in Bloomington, and the hand sign you see in the pictures below is a Kappa greeting.